The AFF course is the unsurpassed method of training if you are interested in jumping with a parachute system designed for an individual and ultimately becoming a licensed skydiver. The AFF course is the most advanced skydiving training course offered and is endorsed by the United States Parachute Association (USPA). 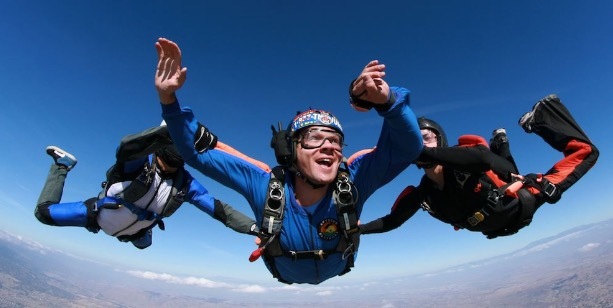 On your first AFF Level, you will receive 6 hours of ground training and learn to skydive solo. You will jump utilizing your own equipment and jumping with two USPA certified instructors. Under normal conditions you will jump the same day as you complete the ground training. The AFF Course/Program is structured in a two-phase training progression program. Phase I consists of eight jumps, where you will be jumping with an instructor on each level. Each one of the eight jumps is regarded to as “learning level.” Each level features a performance objective that must be accomplished prior to advancing to the next level. Completing Phase I qualifies you to make solo skydives under the supervision of an AFF qualified instructor. At this point, you will be allowed to skydive on your own as you will now be on Student Solo Status. What you can expect on your first jump? After reaching the desired altitude (14,000 ft. MSL), it is time to freefall with your two instructors who will grasp your harness on each side. Upon exiting the aircraft, you will quickly accelerate to over 120 miles per hour for up to 60 seconds in freefall! You will then pull the deployment handle and enjoy a breathtaking five-minute flight under your own parachute. Yes, these parachutes truly fly, allowing you to steer your parachute during your descent. We will help you guide your parachute via radio communication and control commands for a safe landing. After the skydive, you will be critiqued and given a First Jump Certificate and a skydiving logbook. As you pass to the next learning level, your instructor will outline the next lesson plan and explain the new objectives.